Thank you for the recognition. It was not expected. But it was appreciated. The volunteer works that we, the ladies of The 601 Habit, all did last year was purely out of the desire to give-back to Korea and the Koreans for all the help that they have given to the Filipinos when the country was tragically hit by one of the strongest typhoons ever recorded, Typhoon Haiyan. Every 4th Saturday of the month, we all spent time with the children housed in Kumkang School, a school/dormitory dedicated to the children of North Korean defectors. This was our “Give-Back Project”. This wasn’t the only project of The 601 Habit. Aside from “The Life Boat Project” and “Hands-On Philippines”, we started with the “Afternoon Socials” with Filipinas currently living here in South Korea. There was also the “Paskong Pinoy” which gathered Filipino-Korean families with the aim to show and let the children feel how we, Filipinos, celebrate Christmas back in the Philippines. 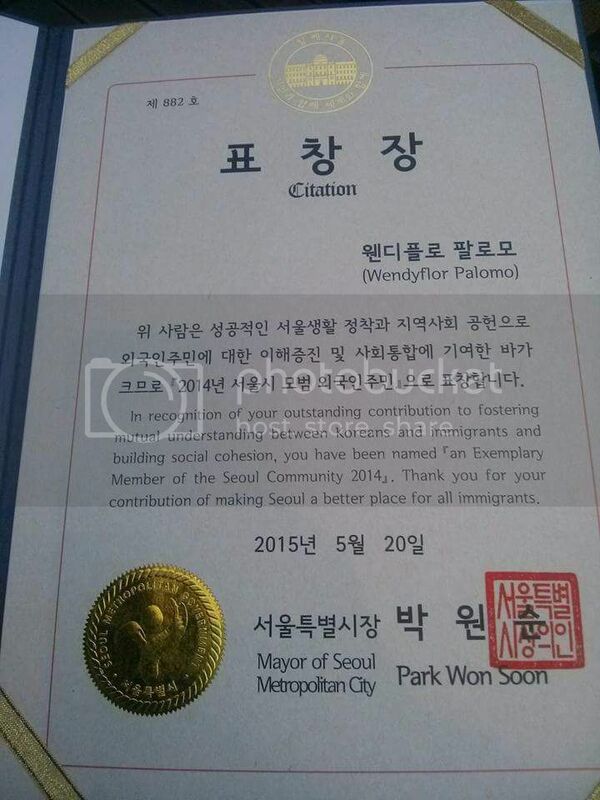 All the ladies spent so much time and effort for all these projects and we would like to thank the Seoul City Government for recognizing our effort last May 20, 2015 during the 8th Together Day. 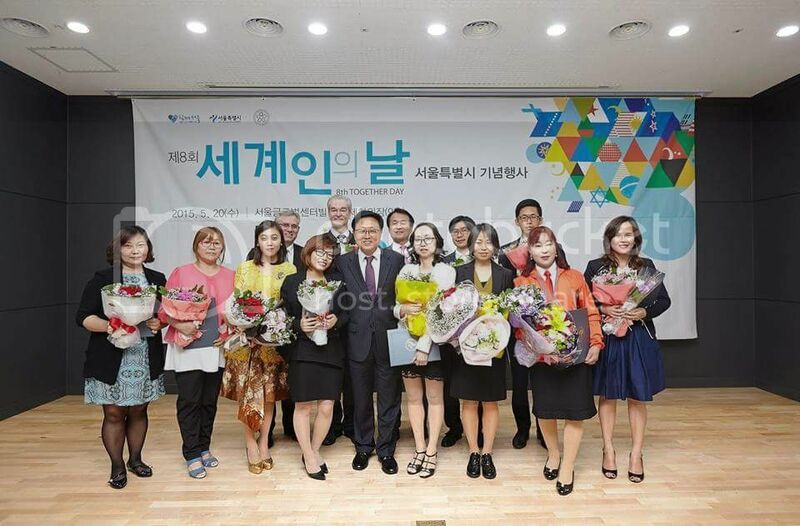 This award would not have been possible if not for the recommendation of Miss Katherine Corteza-Kim, the Director of the Itaewon Global Center. Thank you for noticing the hard work behind every activity. We all know that the planning and the organizing is the more difficult task so we can implement these activities as smoothly as possible. Though the award was given to me and under my name, all the ladies (those resigned and present members) share this honor equally as we individually contributed our time and effort to all the projects that the group had done on its first year of existence. We, the ladies of The 601 Habit, continue as we are. We exist as a group of ladies who like to share life’s celebrations. We live simple lives, free of aspirations for glory. What we do spice up our existence here in South Korea, our adoptive country (in my case, a temporary place that had been kind to me and my family). The things we do together and the gatherings we alternately host bring us closer and develop friendships for life. Some of these relationships had been tested over time. The recognition that we received is a bonus to our existence as a group. We value it greatly and we will continue to look at it as our inspiration. But as we go on with our ordinary lives, we know that an award does not define our value as a group and as individual persons. So, we keep it real. We keep it simple. And we will keep on doing the things we do without pressure to do great and grand.